What Is Sebaceous Hyperplasia and How Can It Be Treated? Are you noticing new bumps popping up all over your face? Does it look like acne, but isn’t really red, won’t “pop” and doesn’t seem to ever go away? If you’re not breaking out, you may have something called sebaceous hyperplasia. Sebaceous hyperplasia is a fairly common condition that can affect both men and women of all ages, but usually happens later in life. The “sebaceous” part of the name comes from the fact that the growths are from your oil glands (or sebocytes). The “hyperplasia” part means enlarged or overgrown. 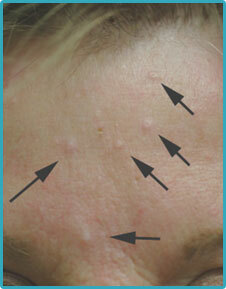 So the spots that you are seeing on your face are simply enlarged oil glands. Normally, our oil glands are unseen, small and beneath the skin’s surface. We don’t really understand why or what triggers the oil glands to overgrow, but sebaceous hyperplasia typically will come up on the areas of the face that are the oiliest. 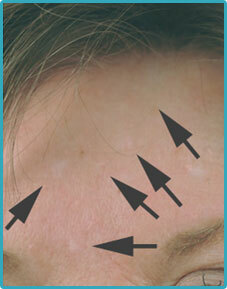 They are not a sign of any underlying skin problem, and are not because of a lack of skin hygiene. Still, many people with sebaceous hyperplasia want to get rid of them because they don’t like the way they look. Celibre Medical Corporation offers a few effective options for sebaceous hyperplasia, but hyfrecation (cauterization) is most consistent. We also offer laser resurfacing, but this option can be more expensive and has longer downtime. Hyfrecation can be done to anyone. It involves using a fine electric “needle” of sorts that can precisely heat and damage the excessive tissue, causing it to gradually fade away. If you’re seeing sebaceous hyperplasia, and want to get rid of them, give us a call. We have proven, safe and effective solutions for you and we would love to help you with this frustrating problem.